This fitness tracker doesn't provide any charging cable or charging plug, which has a built-in USB charger itself. ( Not for Huawei P8, Samsung J3, J5, smartphone Windows, PC, iPad or tablet). Remind by vibrating when your phone receives new call, SMS and SNS notifications. Never miss any important message when you didn't notice your phone. The fitness tracker follows the default system language of your phone, including English, French, German, Italian, Spanish, Japanese and Chinese. We promise a 24-month warranty. Any questions about our products or service, please do not hesitate to contact ANEKEN8888@163.com. We will do our best to solve and improve it ASAP. 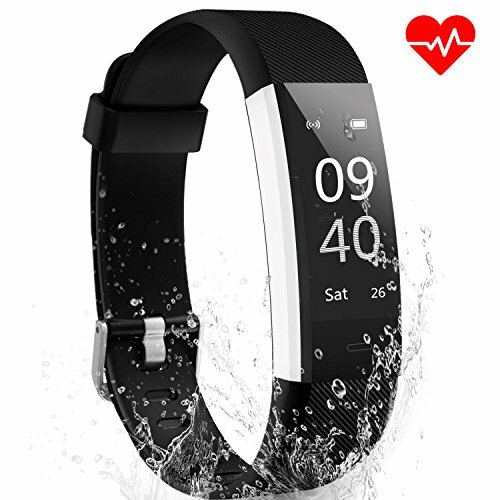 ❤ All-day Activity Tracking: Not only track your heart rate and sleep condition, the smart band will also track your daily activities like steps, distance, calories burned and the minutes you take etc, which help you to get a better understanding of your fitness level. ❤ Call/Message Reminder: Explore more band features in our App "VeryFitPro". The bright OLED tap display can receive call, calendar, SMS and SNS (Facebook, WhatsApp, LinkedIn, Instagram, and Twitter) notifications on display. Never miss important messages when you exercise. ❤ Sleep Monitor & Vibration Alert: Automatically track how long and how well you sleep. Sedentary reminder would help you to keep a healthy working condition away from seating a long time. Streamline designed OLED display and soft rubber strap can fit your wrist properly. ❤ Long Standby Time & Strong Compatibility: Specially designed by a built-in USB plug to charge directly, no cable needed, one single charge gives you about 6-8 days working time; Device widely compatible with Bluetooth 4.0, System: IOS 7.1 or above, Android 4.4 or above. ❤ Satisfied Guarantee: 60 Days Money Back and 2 Years Replacement Warranty. Please do not hesitate to contact us if there is any quality issue for this smart band or you are not happy with your purchase. If you have any questions about this product by ANEKEN, contact us by completing and submitting the form below. If you are looking for a specif part number, please include it with your message.